Yesterday and today are celebrated (for those in the New Calendar) the first Orthodox Saints of North America. Yesterday (December 12th) was the Feast of the Synaxis of the First Martyrs of the American Land, which includes St. Juvenaly and St. Peter the Aleut. Today (December 13th) is one of the feasts of St. Herman of Alaska the Wonderworker. 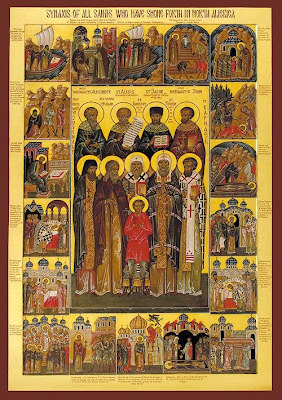 Also, the Synaxis of All Saints of North America is celebrated the Sunday after Pentecost I believe. Their full lives are included elsewhere, but I thought I would post some links to their lives, etc. Thy martyr, O Lord, Holy Hieromartyr St. Juvenaly of Alaska, through his suffering, an incorruptible crown did obtain from Thee, our God; for, rejoicing in Thy strength, he laid low his tormentors and did beat off impotent affronts of the demons also; at his intercessions save our souls. Thy martyr, O Lord, St. Peter the Aleut, through his suffering, an incorruptible crown did obtain from Thee, our God; for, rejoicing in Thy strength, he laid low his tormentors and did beat off impotent affronts of the demons also; at his intercessions save our souls. We are truly blessed by God to be in the same land where, only after a few hundred years of Orthodoxy, many Saints and miracles have shown forth. May God bless our Land as well as every Land, and may all the Holy Saints of America intercede for us all and help us!